I enjoy making smoothies. They are easy, quick, portable and jammed packed with nutrition. I like to think of each smoothie as an experiment and let my creative juices flow. With that, sometimes my smoothies are… okay, and weird colors. But often, they are damn good (if I might say so myself) and this one was damn good! If you try it let me know how it goes in the comments below! Top with slivered almonds & chia seeds. PLANNING TIP: Have an early morning? Pack the blender the night before, keep it in the fridge for a healthy, quick, ready to go meal. 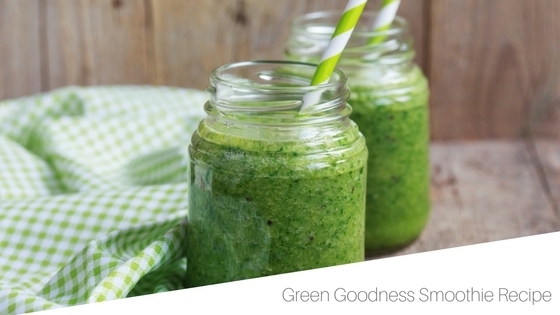 When using this smoothie recipe, wait to add the avocado till morning. Remember, recipes are blueprints. Add in and take out according to your tastes and what you have in the fridge.